OptoFidelity Ltd, the world leader in user interactions testing for smart devices, has agreed on a EUR3.6M funding including growth financing package with Finnish Industry Investment (FII) and the VisionPlus Fund. 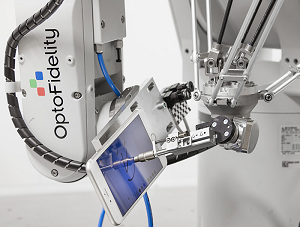 OptoFidelity’s robot-assisted test solutions improve the quality and user experience of smart devices substantially, and speed up and harmonize testing processes between R&D and volume production. Most of the world’s leading manufacturers of smart devices are already OptoFidelity’s customers. The company boasts references from companies such as Google, China Mobile and Atmel. OptoFidelity is set on a path of true global breakthrough. In 2015 the company almost quadrupled its net sales to €20m. With the growth financing now agreed, OptoFidelity will accelerate the opening of new service centres in the USA and China, and speed up the development of production testing offering by strengthening R&D resources in Finland. “We help our customers to design and manufacture the best smart devices in the world by automating and digitizing testing,” explains Pertti Aimonen, OptoFidelity’s CEO from Silicon Valley. “Our company is profitable, but the growth financing allows us to speed up the development of software expertise in Finland and place key engineering competence close to our customers in China and the USA,” adds Aimonen. OptoFidelity launches new solutions for production testing this week at Display Week in San Francisco, USA. Industry 4.0 and the digitization of smart factories is a major element of OptoFidelity’s strategy. OptoFidelity’s strong competence in software development and test data acquisition and analysis methods is an ideal match to the needs of future smart factories. “OptoFidelity has managed to productize its in-depth software knowhow in demanding test and measurement applications, and has already generated a growth spurt without outside investments. The company lists numerous multinational pioneers in industrial digitisation amongst its customers, reinforcing our belief in the competitiveness of the company’s solutions,” says Investment Manager Jussi Sainiemi from Finnish Industry Investment. “The company has already proven its competitiveness and expertise with some of the most sought after customers in the world, and has above all, succeeded in the world’s most highly competed market in Silicon Valley. It was a logical step for us to support OptoFidelity’s growth with our international network,” says Marko Tulonen, VisionPlus Fund’s cofounder and Partner.